Cambridge Assessment International Education (CAIE). 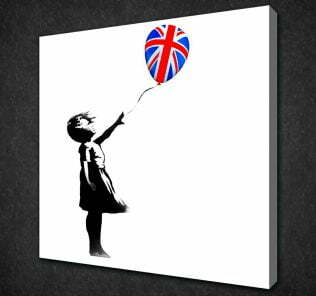 Potentially a beacon school for the value-fee English National Curriculum sector that is already, and inspirationally for its children, punching significantly above its weight of fees. Highly recommended. Founders offers an all-through English National Curriculum to IGCSE and A Level for students from FS1 to Year 13, between 3 and 19 years. Currently GEMS Founders School operates FS1 to Year 9 with planned phasing in of IGCSE and A Level (and potentially, later, BTEC – see below). The School has grown from an initial 1,880 children to its current role of 3,200 children within the first 16 months or so of operation. Waiting lists exist for most year groups and students are representative of 107 Nationalities. Each child is assessed. In build, GEMS advised us, and our sister site, WhichSchoolAdvisor.com, that Founders was being modeled on its family of Winchester schools. 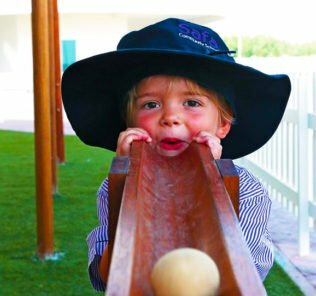 This, however, we felt in practice, told us little as the “Winchester” brand covers a multitude of very different schools from the fabulous, Winchester School Jebel Ali, to the previously troubled GEMS school, GEMS Winchester School Oud Metha. In this context, the Founders’ blueprint is an important one. GEMS is now sufficiently confident of its success commercially that it is launching the second Founder School, GEMS Founders Mizhar, in September this year (2018). Our “First Look” at the new school can be found here. 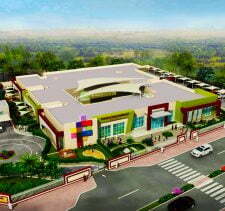 GEMS Founders School, in terms of uptake by parents, was the single largest GEMS opening in its history to date. 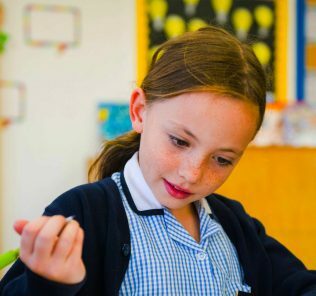 With the school now open, and working through the inevitable challenges of any new school, in conjunction with our first dedicated SchoolsCompared.com visit now completed and recent independent feedback, from both parents and teachers, we consider below whether the reality of GEMS Founders School stacks up to the opening hype. So has GEMS produced the perfect school? The elephant in the room is the trade-offs that have been implented to achieve the price point. What are they? Do they matter? There are, we think, four fundamental ones. The first is a lack of swimming facilities and a dedicated auditorium. Swimming instead is offered off-site by E-sports – parents must sign up for classes off-site and pay E-Sports directly. Many parents, but not all, will bear this; options for swimming in Dubai are legion. The provision of a pool, however, for some parents is seen as the key differentiator, in terms of facilities, of a private school education. This is certainly true of many British parents who often justify the fees over free state education in the UK through the lens of upgraded facilities. Without a pool it is not so easy for a school to prove its value as other indicators, for example, the academic achievement of children in examinations takes many years to be proven. A pool is a nice and shiny representation of investment in children. The second is the choice to both employ higher numbers of less expensive newly Qualified Teachers (NQTs). On this, we take the view that some of the most extraordinary teachers can be those that have just graduated. Educated to absolutely current best practice, and driven in the early years by vocation and passion for making a difference, they can be exceptional. Gems too has its own NQT program provided by both GEMS and TELLAL. There are good and bad teachers, whether NQTS or experienced, and no teacher can deliver perfectly for all children. Chemistry and skills have their inevitable role in the classroom as in everyday life. This said, NQTs soon become experienced. Losing teachers impacts heavily on children and teacher turnover is a blight on education. The pressure in this situation is on GEMS – can it recruit the very best, very best, to a budget? And then, how will it keep them on a budget? With the school now only in its second year, and with most teachers on 2 year contracts, the teacher retention rates are predictably low at 4%.The key insight here will come in 2019. It should be noted too that just over 50% of all teachers at GEMS Founders School Dubai are British (and concomitantly expensive). As of February 2018, feedback on teachers remains very positive, although one trade off with the recruitment of UK NQTs to the Emirates inevitably, given the challenges of relocation, is always some degree of retention. Prospective parents should be aware that there will be a period of transition as faculty bed-in and the school stabilises recruitment of teachers who find a natural fit for life overseas – to date we understand staff retention is not an issue in no small part because of the attractiveness of the school for teachers and slid induction and investment in CPD. Inclusion is subject to genuine (and creditable) investment. The Inclusion department homes 1 counselor with another one being appointed and 10 specialist, qualified faculty. A careers advisor is in the process of being recruited as the school moves towards full-phase provision. Third, GEMS Founders is a very large school with an eventual capacity of some 3,500 students. Big schools are not for all students. Again too, many parents seeking to justify the fees, may not, as a matter of gut instinct, see a big school as fitting their ideal of a top-tier private education. GEMS Founders School is already running at 3200+ capacity and in simple scaling it has been a considerable success. Prospective parents will not find a school that has any of the airy spaces and sense of a school waiting to be filled that we have seen with a number of other newly opened schools. 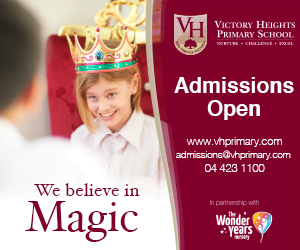 Given the value proposition on offer, the fact that the school has filled places so quickly should not be surprising. It does, however, mean in practice that it inevitably faces the different challenges of any new school launching with an established school capacity, including that it has none of the luxuries of building a school slowly over time. Fourth, subject choice. GEMS has now finalised the IGCSE and A’ Level offer (as of February 2018), and subject options will need to be chosen from blocks. What can be said at this point is that, impressively, parents, through a Year 9 survey, were consulted on the eventual shape of IGCSE provision. However, there are significant compromises here. The overall breadth of subject offer at 19 subjects is limited (compared to sector best of between 26 and 34 subjects). The maximum number of IGCSEs that can be chosen, even for the most gifted children is 8 (a ninth subject may be offered exceptionally in a mother tongue language not taught by Founders subject to the child’s ability). Finally, and most significantly, the blocks of subjects from which children must choose subjects limits the ability of students to combine core Arts and pure Sciences. In practice this means that children cannot study both individual Sciences (Physics, Chemistry or Biology) with Core Arts (History , Geography) and to some degree have to make choices at a very young age as to their eventual academic trajectory. There are a plethora of compromises that stem from the block system including its being impossible to study both History and Geography with Economics. Compromises that stem from the limitation of subject choices take the form of no options in core Social Sciences (Psychology, Sociology), vocational subjects (Travel and Tourism, Accounting), the spectrum of DT subjects or extended sciences (Environmental Management). Founders, to its credit, has sought to moderate the impact of this by providing a Combined Science option for Arts students – and the block structure is well thought out to widen choice as much as possible and group traditionally relevant subjects together. Year 9 parents too were consulted about the eventual shape of IGCSE provision. However, again, choices are limited – and more constrained that even the Winchester School on which Founders was modeled. 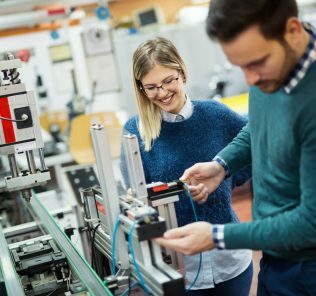 Our view has been consistent that inclusive British schools should be offering technical streams as a matter of expectation – and Founders is already showing itself well placed to build on this in its innovation focus and STEM. A Level options are limited. 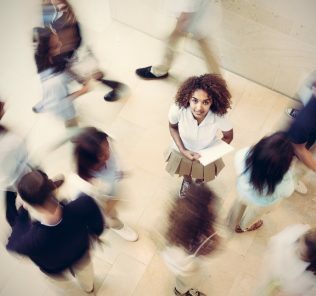 Whilst the number of AS/A Levels that can be taken is not an issue (a mix of between 3 and 5 AS/A Levels can be taken which is standard in British Sixth Forms), the issue is the breadth of options on offer because of the limits on IGSE. In practice this means, at least as it stands, that students will not have the broader technical stream or social science options of students at premium schools. Does this matter? Arguably not for the majority of students content to sit the standard Sciences streams (Biology, Physics, Chemistry, Mathematics, Computer Science) or Arts streams (Geography, History, English, French, Global Perspectives). Economics, Arts &Design and Business too are offered to provide some choice. But do not expect Psychology, Sociology, Government and Politics, Law, Music, Engineering, Travel and Tourism and a large number of other subjects choices that come with higher fees. 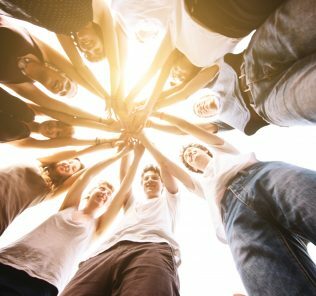 The lack of choice is a compromise – however, the positive is that Founders can concentrate its energy on the subjects that the majority of children want to study – and there is no reason, with the right grades, why any Founders child should not aspire to be accepted at any of the top universities in the world. 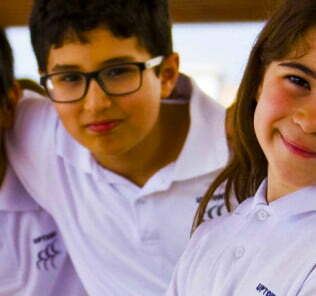 GEMS Founders School Dubai would argue that it is infinitely more preferable to offer a more limited range of subject options and teach those to world class standards, than offer extended subject choice and teach those subjects poorly. Facilities are of a high standard and good breadth. 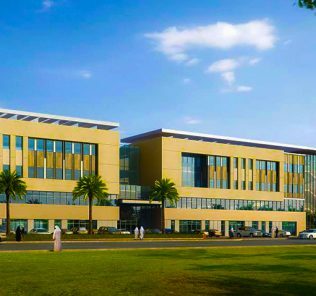 They include a fully digital campus; individual medical facilities for boys and girls; libraries targeted to phases, a multi-purpose sports/theatre auditorium with full production facilities for drama and basketball court; multiple arts and crafts/music rooms, medical centre; ICT labs by phase; Canteen; FS play areas; a bookshop; 2 fully-equipped science laboratories; technology rooms; a Dance Studio (which doubles as a Black Box theatre); Music Room; and a further 4 rooms for peripatetic lessons, one of which had been (impressively) adapted by students and transformed into a working recording studio. Sports facilities, in absence of swimming pools, do include sports fields; a rooftop 11 aside football pitch; extensive athletic provision including running tracks; and fully shaded external areas (used, for example, for Real Madrid football coaching). A rooftop situated shaded area provides additional recreational areas for the students including a 5-a-side football pitch and cricket nets as well as seating areas for Secondary School children. The school buildings are square and functional, light and attractive and scaled on a series of long corridors to accommodate the volume of classes ( 22 x FS2 and 15 x FS1 ). Corridors are wide and have strip lighting. FS classes are paired with toilet facilities centrally placed. “Small Steps” an initiative started at GEMS Metropole has been extended to Gems Founders and is lead by Inderjot Singh. It creates a space within the school for young children with greater SEN requirements than could normally be managed with a view to full integration into the school when appropriate. There is a clinic with 1 resident Dr and 3 Nurses. 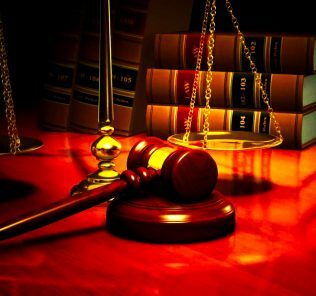 As we advised in our launch review, the devil in every case of facilities provision, however, is in the detail. An auditorium can be basic, or extraordinary. 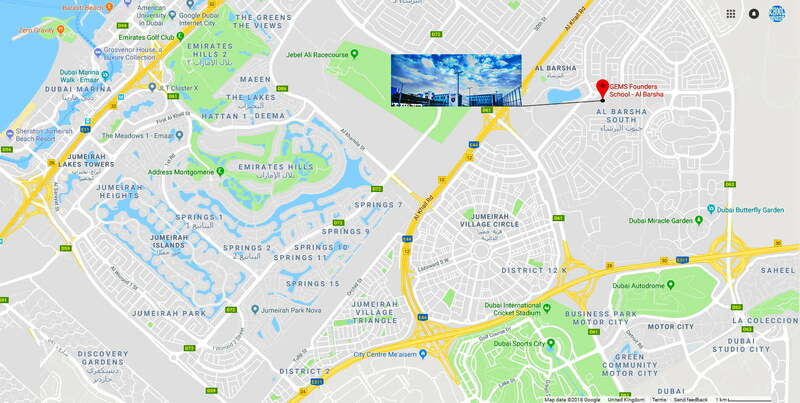 Founders, as expected, has launched with facilities that fall somewhere between the two – but certainly of a very good functional standard offering excellent ROI for a GEMS school. If we had to summarise what is taking place here we would describe it as entrepreneurial – there is absolutely no shortage of the facilities that matter – and what the children need, the schools works together to make happen (as in the Recording Studio, but there are many other examples, including the launch of an Innovation Prize to spur New product Development – see below). Whilst the process of “nesting” into the building is on going, we were extremely impressed with art panels depicting cultures represented in the school (Egypt, Tuscan / Japan / India / Mexico / Australia / Canada to begin….). 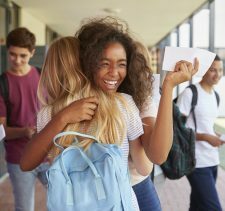 We have not seen this quality and consistency of approach to celebrating school culture and the qualities and achievement of students carried out quite so well for a very long time. The hope is that these will be extended over the coming years. 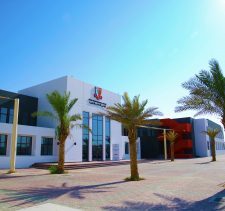 With fees ranging between AED 22,000 at FS1 to just AED 33,000 in Year 13, GEMS has created a British school firmly within the value fees sector. It is difficult to put this achievement in context – in many ways GEMS has created a school that competes only with itself for the value on offer here. We have received particularly positive feedback from both teachers and parents on the school’s leadership. Matthew Burfield, Founders Principal and CEO, studied History and Politics at Sussex (it’s recognised as being one of the top universities in the UK for this degree) and brings with him more than a decade’s UK and international teaching experience. He has professional teaching qualifications from both Sussex and Warwick, the latter focussed on innovation and something that certainly reinforces his credentials as the leader of what is in many ways a radical school for GEMS in its need to traverse the competing demands of value fees and premium delivery. He has been described to us in terms of his being extremely engaged with parents, passionate about what can be achieved and also very committed to building teaching capacity and investing in their professional development. On that note, feedback has been very positive about how both he and Founders’ Vice Principal, Janet Foley, are working exceptionally closely to pull the school together – no small challenge given the demands identified above of a school launching at capacity in its phased opening, currently to Year 9. Mr Burfield was nominated for one of five GEMS “Exceptional Head of School” award in 2018. It is telling that Mr Burfield allocated his personal prize money to establish the “Adam Burfield Innovation Award.” Named after his brother, the Award offers an AED 10,000 fund to enable one group of students in the school to bring their innovative idea to fruition through the purchase of required parts and to cover manufacturing costs. This is the sort of initiative we are increasingly seeing deployed in a number of top tier schools, in some cases to take student ideas through manufacture and eventual patenting. Given Mr Burfield’s generosity, and evident commitment to the children under his care, we would hope that GEMS will ensure the award continues beyond its first year’s funding. So has GEMS, with Founders School Dubai, succeeded where others have feared to tread in delivering value fees with a premium quality of education? It is sometimes easy to forget with new schools and all the excitement that comes with them, that buildings are only the skin-deep part of the equation. It is children that count, and parents will have invested everything in GEMS to deliver for them. 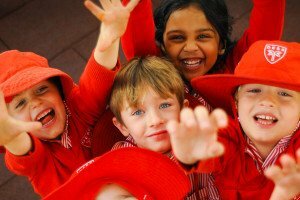 The first two year of a school can so often define its course, both in terms of expectation but also culture. Getting the nuts and bolts working together, for any new school is never easy. But there comes extra pressure for GEMS given its reputation and the commitments it has made for Founders. 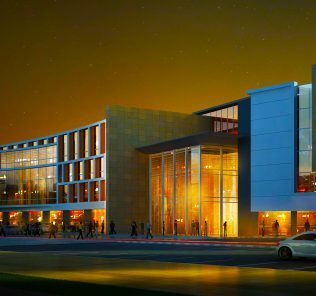 It’s early days but on balance we think that the new GEMS Founders School Dubai is delivering – and in spades. 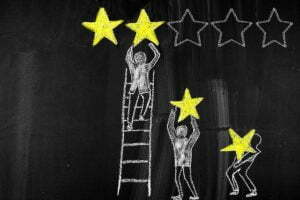 GEMS, it must be said, is the most experienced of any education provider in launching news schools and teething issues, always inevitable, have certainly been more limited than we have noted in many other launching schools, and are, our feedback suggests, being dealt with swiftly and effectively. What makes GEMS Founders stand-out – and this is probably the most telling insight we can offer, is not, for us, the value proposition of its fees – and this despite there being considerable value on offer here. 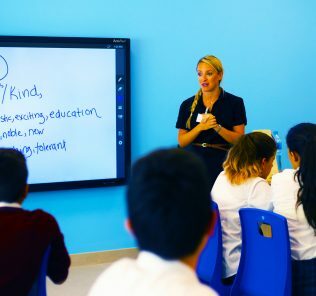 It is, instead, the very personal engagement with children and culture of kindness that has been embedded in the school both by Mr Burfield and the enthusiastic young teachers that have been chosen to guide the evolution of this, in many ways extraordinarily good, young school that makes GEMS Founders School Dubai shine. Yes, “function” and “purpose” are better words for describing facilities at GEMS Founders than “glitz” or “glamour” – do not expect the bells and whistles found so visibly in premium schools. But do pools and stand-alone theatres really matter when set against the substance of a happy school experience, whole child development and strong, value-added, academic success? Probably not. On our 2017-18 visit we experienced the result of this culture – an overwhelming sense that the Founders’ children are happy, inquisitive and engaged. 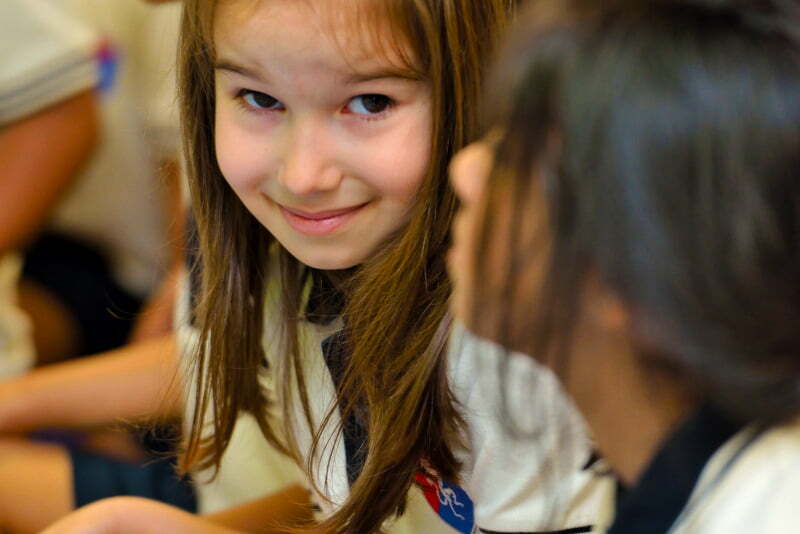 GEMS Founders is a very, very inspiring school in which children clearly and demonstrably take delight in learning. It is far too few schools for which we can say he same applies. Matthew Burfield is clearly much loved – on our visit the children’s clamoured to share stories with him. As children left the library, clutching their books for dear life, they surrounded him to celebrate the books they had chosen and explain why they had been chosen. Their enthusiasm was genuine and infectious – but the bigger picture here is that Founders has seems to have discovered the secret recipe to instilling an unqualified love of reading in children from a very young age – no small feat. It was impossible not to be moved. The school exudes inspiration and the love of the adventure of learning is demonstrated by its children in the handfuls. Again, during our visit, we found ourselves at the centre of an entire section of the school learning about natural history through a collective search of the corridors for dinosaurs. However the teachers had achieved it, the children were purposeful and filled with a transparent and infectiously attractive awe and immersion in the learning process that, as with so many other areas of Founders, is of a quality that we have seen in less than a single handful of other schools. The engagement of the children, especially the younger ones, was more powerful at GEMS Founders than in any school we have visited in the last two years. Mid-tier schools are needed. The majority of parents, with all good intentions and stretching of family finances, simply cannot afford premium fees. Parents too, all parents, want the absolute best for their children – and many parents identify “best” and “GEMS” in the same breath. 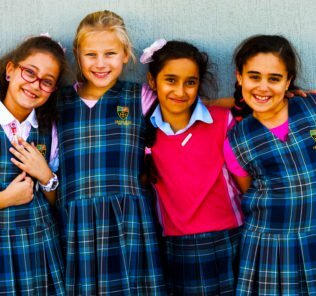 On this basis, GEMS deserves considerable credit for investing in mid-tier opportunities for children who would otherwise not have the chance of a GEMS Education. The real credit here is, of course, that they have made it work. This said, it still remains early days. 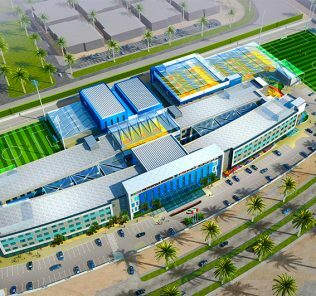 GEMS Founders School Dubai has yet to open to full all-through provision and it is far too early for it to prove itself academically. Similarly we do think that the Founders should aspire to broaden its breadth of subject offer at IGCSE and A level – and at a minimum provide BTEC choices for students. But, notwithstanding this, there is something very special about this school, and its Principal, Matthew Burfield. What has been achieved is exceptional by any standards – but taking into account the fee structure, we think, quite extraordinary. On the basis of our SchoolsCompared.com 2017-18 visit, and independent feedback received from parents and teachers across both ours and our sister site, WhichSchoolAdvsior.com, the leadership, parents, teachers – and children of GEMS Founders deserve to feel very proud of what they have achieved in such a very short space of time. If the all-through school mirrors what has been achieved thus far, we are looking at a very special school for Dubai to come.